Well although we are well into January, I think it's still okay to wish you all a happy and peaceful 2019! I hope you all had a super festive season. 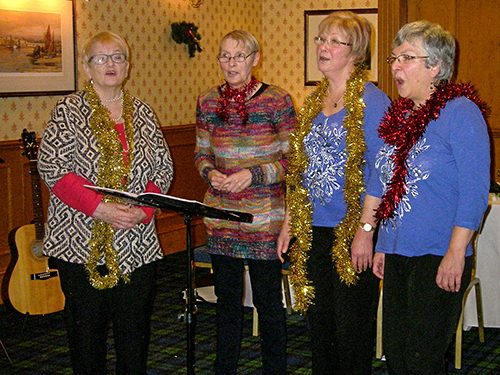 "Four Scots and a Geordie" are practicing for a gig we have been asked to sing at on 5 April. It's something to do with WRI groups all getting together and is to be held in the Kirriemuir Old Parish Church. Also taking part are the duo Kirrie the Fit, (they do a take of Scotland the What). Joe Aitken, the well known bothy ballad singer is to be both compére and performer, so we are practising furiously to be as good as we can be. On 27 February, Angus Folk will be performing in the same church, I think. I'm not entirely sure who we will be singing for; all I know is that we have been asked by one of our members to participate, so it could be another WRI group. Now onto my health. I had my six monthly brain scan earlier this month and i'll receive the results on 12 February, so fingers crossed there is still no sign of the tumour growing back! It's always a slight worry going for the result, because even though I feel okay, I never know what will show up. I went swimming on Friday past, the first time I've done so since my suspected TIA, but I was fine (thank goodness). I've joined the Royal Hotel's fitness suite and spa and because it's in the centre of Forfar, it's within easy travelling distance. I think that's all for now. As always, take good care everyone.